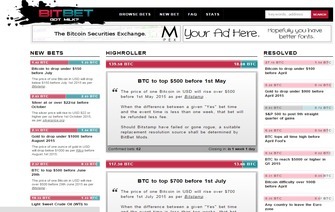 First appearing online in the middle of 2013, BitBet.us looked to be a legitimate Bitcoin wagering operation that was unique in how it was set up for wagering. BitBet operated on players being able to wager Bitcoin on particular propositions, mostly dealing with financial aspect of Bitcoin itself. Players interested in wagering on the propositions would place a deposit, then choose the particular side of the proposition that that they wanted. For a hypothetical example, a proposition bet that listed that Bitcoin would be above or below the price of $400 at the end of a particular month. On the outside looking in, it looked like a fun way to bet financial futures with Bitcoin, but it’s major red flags from the very beginning seemed to be a concern that many players using BitBet.us failed to see. One of the bigger red flags BitBet had was the fact that a lot of the propositions weren’t even set in a professional manner. The site displayed and continues to display calculations that are frankly either too aggressive or too conservative in the approach of how proposition bets are calculated. Numbers that are too highly skewed will obviously take on a lot of punters for that side, just as a line in a particular sporting event might garner too much attention towards. Just as a hypothetical example, it is like two evenly matched World Cup teams known for their defense, being given a total goals line of 4 and a half, with no research being done on why that number was set that high. While some of the numbers do make sense, causing an equal amount of wagers for each side, quite a bit of the proposition bets are completely off. Which leads to red flag #2. “Every bet has two sides. Every bettor on the winning side will receive as follows : 99% of his original bet sum (1% goes to BitBet.us) plus 99% of his bet times the total bet by the losing side multiplied by his bet’s total weight and divided by the winning side total weight. An important point to consider is that if the “plus” side of that calculation does not exceed the 1% charged by BitBet it is possible to win less BTC than the original bet. So for instance if someone bets 10`000 BTC and the losing side consists of 1 BTC only then the 10`000 bettor will have lost 100 BTC in BitBet fees for a maximum upside of 1 BTC (because obviously he can’t win more than what the other people have bet). In a simplified version of that confusing explanation, it’s basically saying you gain or lose dependent on the overall outcome of how many people have won or lost, and not necessarily favored to gain or lose what you might have expected. A red flag when it comes to any sort of wagering, are the desired payouts when a player places a wager. The third and biggest complaint is the amount of legitimate complaints that can be found about the integrity of BitBet.us. While all complaints may not be valid in some may come from sore losers, it is worth noting that BitBet never responds to any of the complaints, which has ultimately indicated that they are most likely a scam. One of the most common complaints that seem to be related to BitBet.us is the fact that bets are being taken but once it is time for the bet to be resolved, they basically seem to be “missing from the records”, and are never returned to the player and essentially are stolen. In conclusion, from the very beginning, BitBet looked about as unreliable as any site that accepts Bitcoin as a form of wagering. It’s lack of a central design based around any sort of substantial wagering proposition or game, ultimately should have had players quickly exiting the site. Instead, as of April 2015, the site is still alive and still accepting bets. It is highly advisable to stay away from BitBet.us until it can be explained what it is that is exactly going on with how the site is running.